The orogénesis of the Japanese archipelago is tie to the Pacific an Philippines plate subduction. The successive caused foldings and lateral high pressures which the rocks have been put under, modeling a great mountain arc. 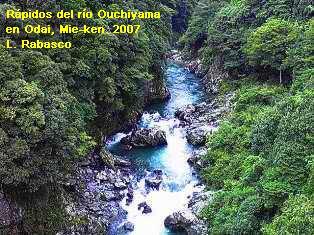 In the narrow valleys appear places setting of a dense humid forest. The rivers course from origin to the sea is relatively short (they do not surpass 150 km in many cases), reason why the curve of its longitudinal profile is very pronounced and far away from its balance profile. And it is necessary to consider that due to the continuous rise, its basic level varies successively make younger the fluvial courses. 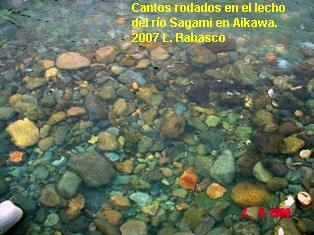 In its way towards the sea, the water finds different lithology spices of hardness causing numerous cascades and water falls. The flood zones in the average course are taken advantage for the rice culture almost exclusively, and its low course is characterizes by the practical absence of meanders and deltas in the opening. According to the tide, the marine water bursts in several kilometres into the estuary. As we ascend towards the source, the rocks are outlined more angulous. On the other side, in the average course the rocks already eroded during the transport, are displaying cleared forms more and more. The selection of sizes also is made concrete as we are descending and it indicates the erosion degree and division which they have been put under. In this water they do not lack some unique species in the world like Daisanshobo, a variety of great salamander that can be alive more than100 years. Next Next post: Afloramientos acuiferos en el entorno urbano.